Horderns Beach from the ferry landing. This summer’s beaches have created challenges. I should have begun with No 35 Gunyah (Brooklyn) – up on the Hawkesbury – but it can only be reached from the water so I need my mate and his boat at a time that works for us both and the weather is amenable. I broke my rules and skipped to No 36 Gunyah (Bundeena); No 37 is Halletts – another Hawkesbury beach with water access only – has been added to the boating list. 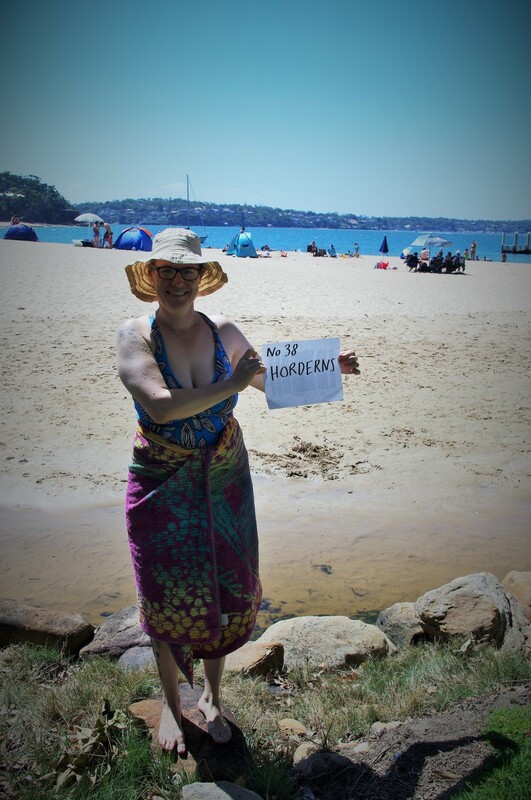 Which brings us back to Bundeena for No 38, Horderns. I’ve failed to find the connection but I presume Horderns Beach is associated with the Hordern Family – the 19th and 20th century retailing dynasty. They of the now defunct and demolished Anthony Hordern & Sons – once the world’s largest department store (on the site of what is now World Square); also, of course, the Pavilion, the Fountain (at the corner of Pyrmont St and Pyrmont Bridge Rd) and a scattering of heritage listed homes. An American work colleague of mine, Joe, has taken an interest in this blog – which is lovely – he lives in Cronulla and his mother is visiting from wintery Michigan. I’ve taken the train to Cronulla, where we will meet and catch the ferry across Port Hacking to Bundeena. Awaiting their arrival at Grind I spot a kid who couldn’t have been more of a stereotype if he tried: about 12-years old with sun-bleached, salt-sculptured nearly shoulder-length hair; his skin was golden, his eyes were blue; he strode barefoot on the hot bitumen like he’d never worn shoes. When he finished helping him mum and he rolled past on his skateboard it was to a soundtrack of Forever Young (in my head). Joe is a big – as in tall and athletic – gregarious guy. He’s a genuinely nice fellow, interested in others and always smiling. I like that Joe, unlike a lot of the other Americans who come to work for the Australian Baseball League, determined to live near the beach, had chosen Cronulla and, once there, had thrown himself into life in the community and made a lot of local friends. His mother, Bianca – not surprisingly is equally outgoing with a big exiled Noo Yawka personality (life has taken her from the Big Apple to upstate New York then west to Michigan following her husband’s academic career – but it’s clear that “New Yorker” is very much a key part of her identity). On the ferry Bianca regales us (and perhaps embarrasses Joe) with stories of her son, her daughter, her husband and life in Michigan. Once in Bundeena we wander up the hill to the RSL for lunch – I again have the fish and chips and they are, again, excellent. The RSL is exactly as it was two weeks ago … same Santa decorations and tinsel and baubles, but now they’ve added a Christmas tree beneath the plastic eternal flame. Then we go to the beach. It is a good, if not perfect, beach day: hot in the sun but with a cooling breeze. It’s busy but not chockers. There are family groups enjoying picnics and barbeques in the shade of the fig trees while others have erected tents and umbrellas on the hot exposed sand. The usual multicultural colourwheel of Sydneysiders are here: a Muslim family getting their charcoal grill going, a group of Asian students engaging is a supersoaker battle royale, European backpackers, and a ramshackle mix of mongrel Whitefella Australians. 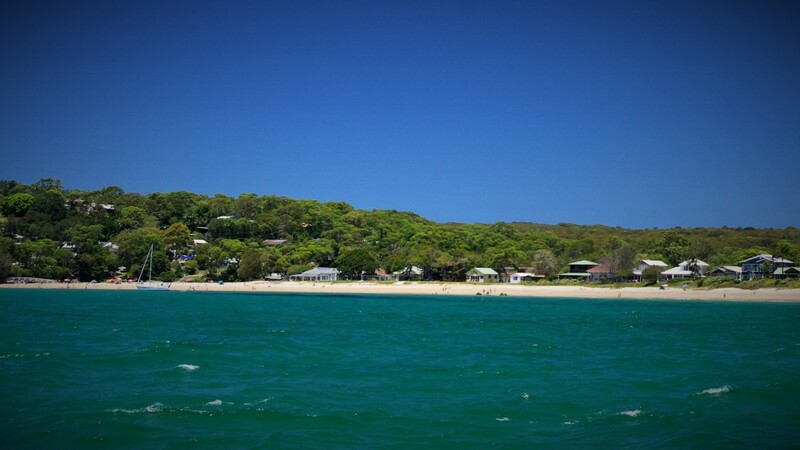 Hordern is a long – 200 or 300 metres – shallow curve of sand stretching west from the ferry wharf. 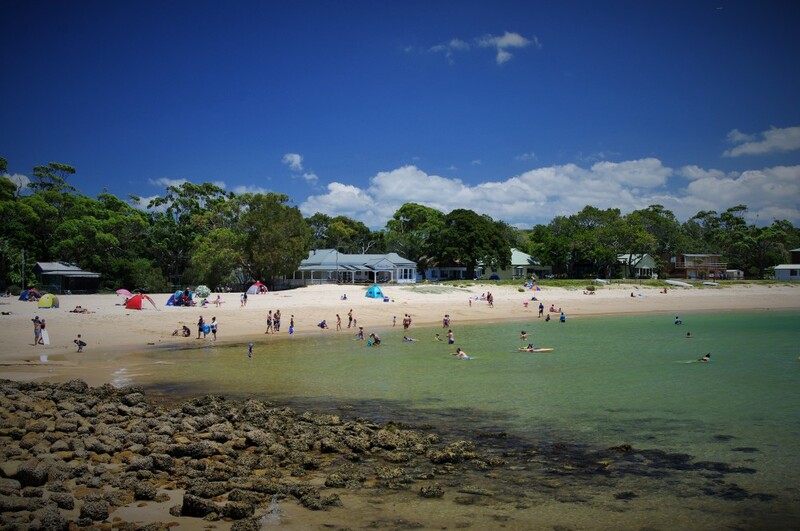 The eastern end, where we set up, is separated from the town centre of Bundeena by a park. Along the rest, houses, lovely enviable houses, face Port Hacking and Cronulla beyond with only the beach and scrubby dune between porches and the beach. We swim. The water is shallow and clear; it has warm pockets and cool ones; the breeze blows goosebumps onto my wet, exposed skin. 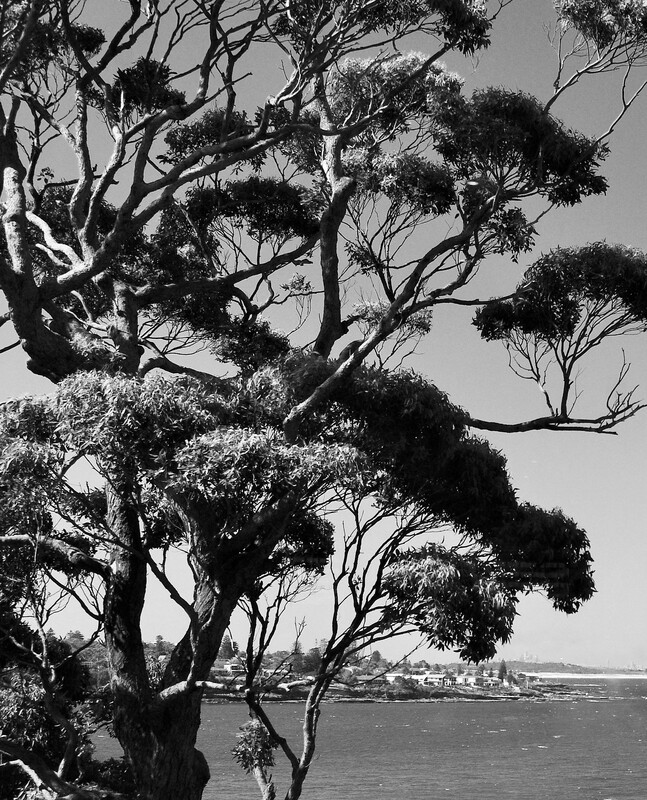 Bianca speaks of snow drifts and compares Bundeena favourably with heaven. I sit on the sand warming in the sun when my friend Jim arrives and we join the others back in the water. Bianca tells a tale of bringing baby Joe home for the first time just after a blizzard in Syracuse – “Remember that Joe?” she asks and Joe smiles that smile of resignation to a parent’s repetitive joke. When we’ve been in long enough Joe and Bianca move on to Gunyah while Jim and I retreat to the RSL – I’m becoming a regular. Look, it was a nice visit but returning to the same suburb so soon (and knowing that the final beach in the Bundeena triptych – Jibbon- is just around the corner) took a little of the excitement and adventure out of the day. Still, it was lovely. It was Sunday, the sun was shining warmly, the water was mostly pleasant … any complaints would be frivolous. Horderns Beach is 30 km (19 miles) from home (via the shortest route to Cronulla and the ferry). It’s in the Sutherland Shire Local Government Area, Heathcote State Electorate (Lee Evans, Liberal) and Cunningham Federal Division (Sharon Bird, Labor).